Graham Greene’s Brighton Rock is about hell. It is about hell on earth. It is about what it is like to live in this world – with barely a trace of humanity. More specifically, the novel concerns killers and one killer in particular. This is Pinkie, a seventeen year old gangster from a Brighton slum, who had once been a choirboy as a child and had wanted to become a priest. Pinkie never knows any peace of mind. He is never safe. And so he kills: One person after another person after another person must be ‘dispatched’ to create the illusion of being safe in this world. And yet Pinkie is marked indelibly by the Mystery of the Catholic Sacraments he received in a childhood unusually horrific. They have not been enough to save him. He knows, as he murders, that he has chosen the path of mortal sin. But the memories stand out as continuous reminders of an alternate road he has not taken and will not take. This is the first of Graham Greene‘s series of Catholic novels from 1938. The picture of life it paints is not pretty. The novel that would follow it in 1940, The Power and the Glory is also wretched. Now, I have also reviewed The Power and the Glory here at this website. And I should like to borrow a few words from that review. [Greene] observes the human heart in all its ever shifting tinctures. Tinctures spanning a wide spectrum from malevolence, hatred, contempt and fear to tenderness, heroism, frailty, love and compassion – as well as sublime faith in and dedication to God. 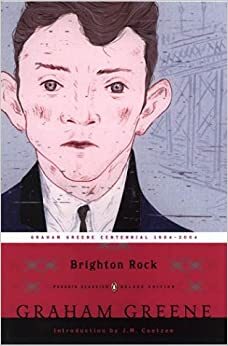 Here is what made Greene great – however it has to be said that unlike The Power and the Glory, the accent in Brighton Rock is much more on ‘malevolence, hatred, contempt and fear’ than anything else. Hell is the state of the soul powerless to come out of itself, absolute self-centredness, dark and evil isolation, i.e. final inability to love. What is it like to have the mind dwelling continuously on anxiety? What is it like to not be able to trust a single other human being on this Earth? If someone were to approach you, dear Reader, with nothing but goodwill, what would it be like to not even have the slightest clue that goodwill existed – because virtually nothing of goodwill existed in your own heart? To not have a clue that another human soul could actually care for you? Brighton Rock is a meditation on such questions. It is a meditation on the reality and unspeakable tragedy of hell – in the form of the soul of a psychopath. It is a meditation on what it is to be completely walled-off from Christ. And yet throughout the book, the reader is given the sense that Christ, His angels and His Church, are trying to reach through the wall of Pinkie’s fear and hate – that indeed, despite everything, the light shines on in the darkness. For Pinkie continuously remembers the Mystery he has witnessed in his horrifying childhood. Towards the end of the novel, Pinkie is moving towards another murder, but, this time, he has formed the barest of emotional attachments to his intended victim. Here is how Greene reveals the presence of Grace trying desperately to break through – with the suggestion of a statue triggering a memory from his childhood. He put the revolver back and went out into the passage. That was the next move. Another statuette painted an obscure moral with cemetery hands and a chaplet of marble flowers, and again he felt the prowling presence of pity. If the glass broke, if the beast – whatever it was – got in, God knows what it would do. He had a sense of huge havoc – the confession, the penance and the sacrament – and awful distraction, and he drove blind into the rain. He could see nothing through the cracked stained windscreen. We are loathe to give more away. This review, so-called, is less than a real review. Perhaps it is more like a little tribute to Greene’s genius. There is much else, very much else, in the book we will pass over in silence. We will just mention briefly the character of Rose – Pinkie’s last intended victim in the above. Rose is another Catholic from the slum. Roses loves the serial killer and out of love for him is fully prepared to be damned with him. The novel ends with Rose raging to a priest, who understands the nature of a love, willing to be damned for the sake of love. I will not say much for fear of spoiling. But the ending is potent, potent indeed. Paradoxical, poignant, painful as the priest holds out the hope that Pinkie may yet be saved. She was defiant and tearless in the stuffy box; the old priest had a cold and smelt of eucalyptus. Outside the chairs creaked again and again people impatient to get their own repentance, absolution, penance finished for the week. Greene, I think, accomplishes extraordinary things in his novels. Still, if I were recommending Catholics new to him, I would not recommend starting with Brighton Rock. Despite passages like the above, the book is, for the most part, relentlessly grim and disturbing. Still, I remain immensely grateful for the entire series of Greene’s Catholic novels. Brighton Rock forms a dark beginning. More light will break forth as the series proceeds with The Power and the Glory (again reviewed here) and concludes with Monsignor Quixote (reviewed in-depth here). This entry was posted in Reviews and tagged Catholic Arts, Catholic England, Catholic Mystery, Graham Greene. Bookmark the permalink. Post a comment or leave a trackback: Trackback URL.